All bookings at The BarDew Valley Inn are subject to these Terms. We accept the following methods of payment: credit cards: American Express, MasterCard, Visa, Discover, and debit cards. When a reservation is booked, 100% of the total amount of the stay will be charged to the credit card provided. Any additional packages will also be charged to the credit card provided when a reservation is booked. All outstanding charges will be charged to the credit card upon check-out. Cancellation of a package will be charged a $55 processing fee except for dog lodging fees. Refunds can take up to 48 hours to appear as a credit on your credit card. Check-in time is 3:00 pm (or after) on the day of arrival. In the interest of security, and to verify identity, guests are asked to present photo ID upon check-in. The person checking in must be eighteen years of age or older. Check-out time is 11:00 am on the day of departure. Late check-out may be requested and will be subject to availability. 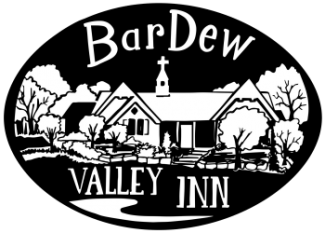 Rooms are subject to maximum occupancy rules set by The BarDew Valley Inn (2 person maximum). Please contact us if you have any questions. We do not provide or have available extra beds. Anti-scalping policy: We do not permit our rooms to be booked by third parties and resold. We reserve the right to cancel any reservations that are made by such groups. The pet lodging fee is $25 per DOG per day. We cannot accommodate other animals. We only allow pets in the New York Suite. You may have no more than two pets per room. Out of consideration of other guests, pets must be quiet in the room and on a leash when outside. Pets are not allowed in or on the beds or furniture. If pet hair is found on the sheets, duvet, pillow cases, or furniture cushions there will be a minimum $100 cleaning charge added to your bill. Pets are not permitted in the dining room or kitchen area. Dogs must be securely crated when left alone in your room or removed from the room. If your pet has any "accidents" in the room, please contact us at 918-397-2404. A cell phone number must be provided in case your pet is disturbing other guests while you are away from your room. Guests are required to pick up behind their pets. We provide bags and disposal bins. All rooms are non-smoking and non-vaping. Smoking & vaping areas are allowed outside on the patios only. Guests who smoke or vape in any indoor area of the Inn including the bathroom will be charged an extra fee (up to $150) to clean and repair the room. Please be considerate of all other guests while smoking in allowed areas.